Friday Vanessa and I each took a vacation day so we could enjoy a helicopter ride out to the Grand Canyon! The shuttle picked us up at The Venetian a little after 7 a.m. for our 9:00 excursion, so it was an earlier morning than I would have PREFERRED, but I'll give them a pass since it was a helicopter tour and everything. After our safety briefing in the hangar, we walked right out to the bird and jumped in! I'm kind of ridiculous about helicopters ... this was my third ride in one (you can read about my second ride here), and I'm constantly hoping the pilot will point the nose down and plow through the air or bank harder to the left or right than he does. I JUST LOVE IT. 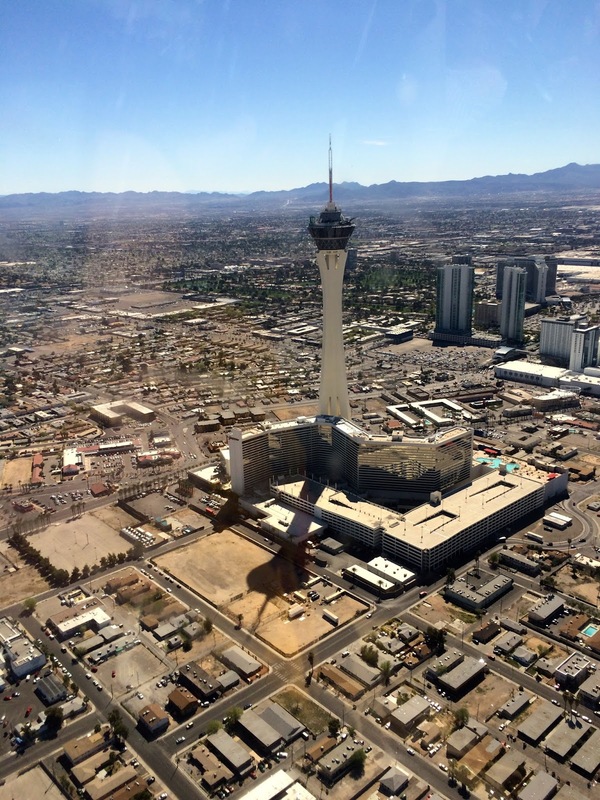 We flew up, out of the airport and away from The Strip, out toward the desert. We lucked out that it was a gorgeous day! Visibility was terrific. 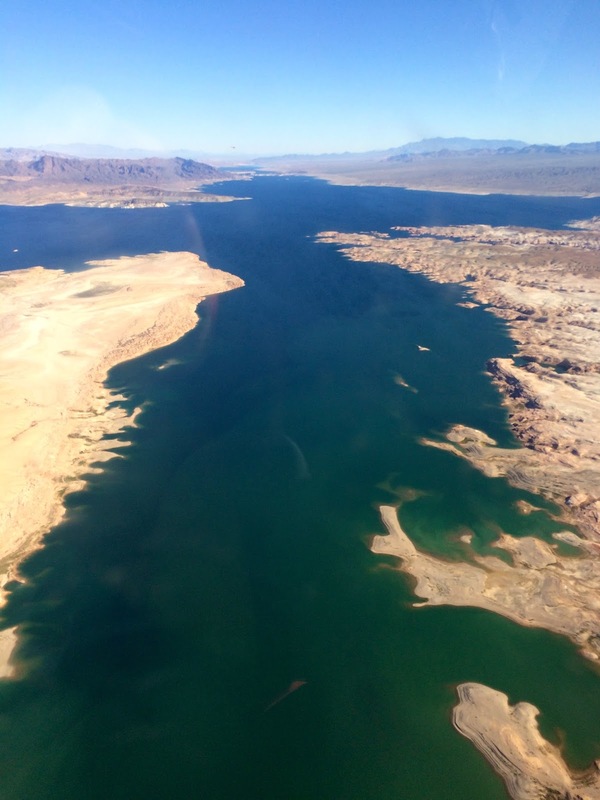 Before long, we were over Lake Las Vegas, where Celine Dion and Nigel Lithgoe live. It's this bizarre little oasis on a manmade lake about 25 minutes (17 miles) outside of Vegas, but it's experienced a lot of financial trouble in the past several years. 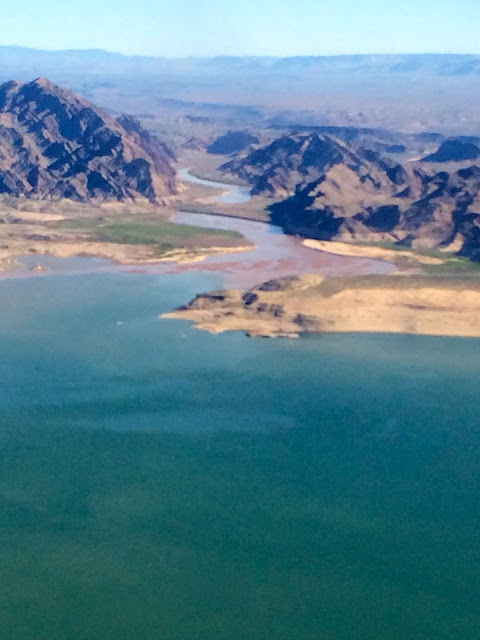 Not long after we cleared Lake Las Vegas, Lake Mead came into view. 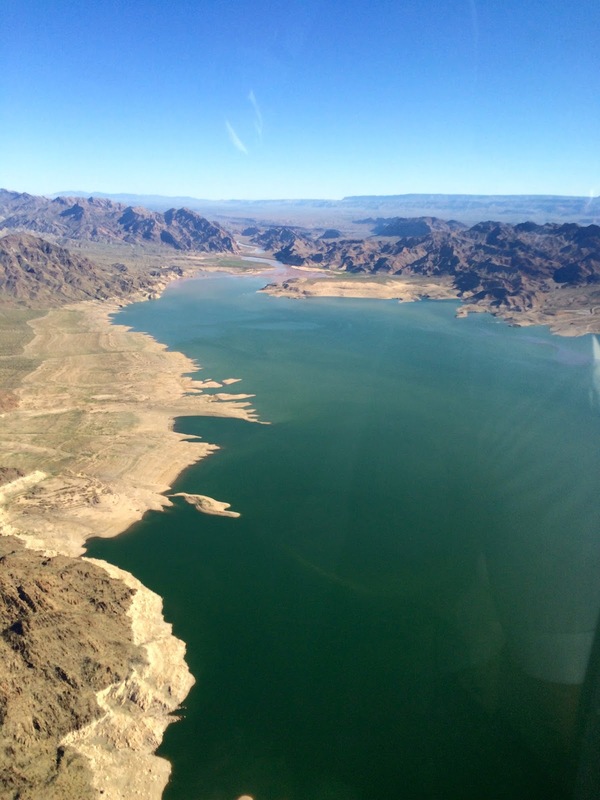 I think it's less than 10 miles from Lake Las Vegas, and it is huge! 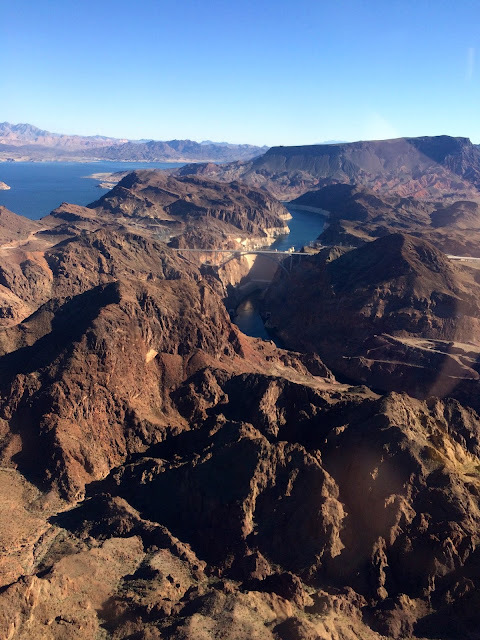 I'd never seen the Hoover Dam before, either ... we didn't set the copter down and get out, but we did fly close to it. Our pilot was really well-informed about the area and its challenges. He said that when the lake is full, it's about 112 miles long and the largest reservoir in the U.S. But he also said that it hasn't reached maximum capacity since the early 1980s because of tremendous drought and the demand for water. In many places around the lake, it was easy to see previous water-level lines. 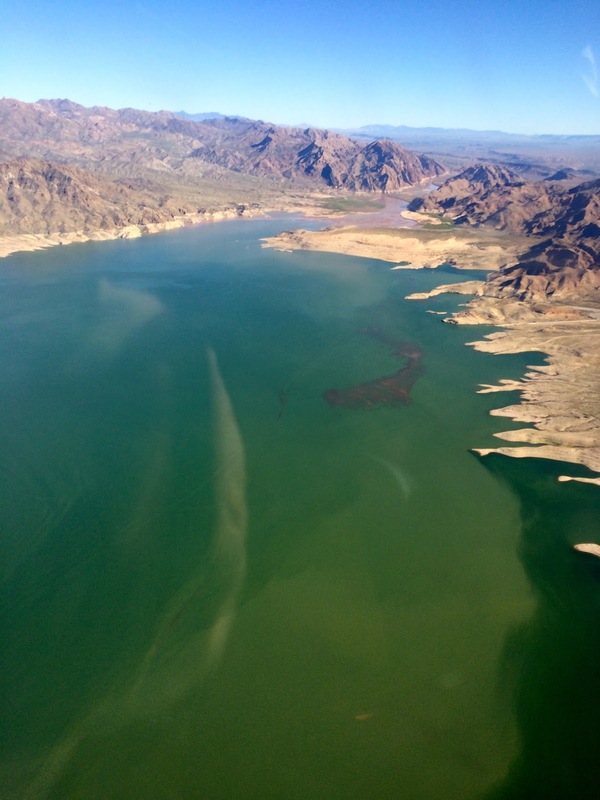 The colors of the landscape were absolutely stunning ... our pilot said it's because of all of the minerals in the soil. I loved flying over this section of the lake, where it formed a giant cross. The pilot explained that as the river water moves across the lake, the sediment from the river sinks to the bottom of the lake, leaving only the clean water. THANK GOODNESS. 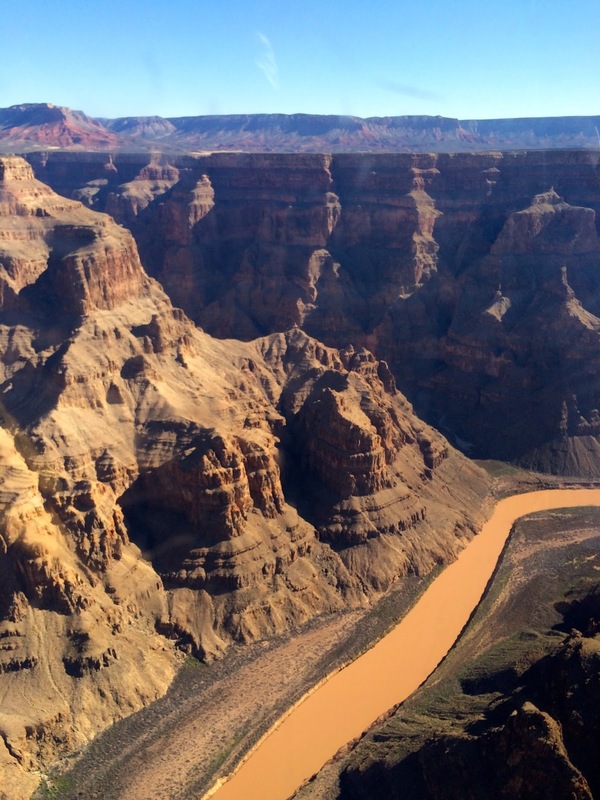 Up next, we entered the mouth of the Grand Canyon! The pilot PROBABLY talked during this part. I don't remember anything he said. I feel confident telling you that that is the Colorado River down there. 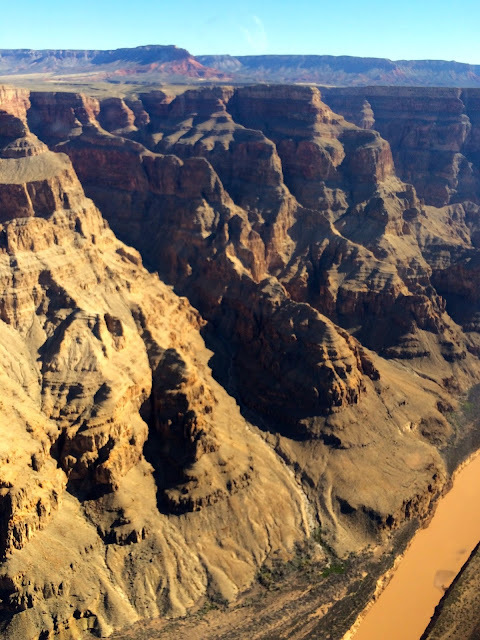 Also, if you have questions about the Grand Canyon, you may visit Wikipedia. We flew to the Skywalk on the west side of the park, where you walk out onto a glass walkway and can see all the way down to the bottom of the canyon. It was amazing! 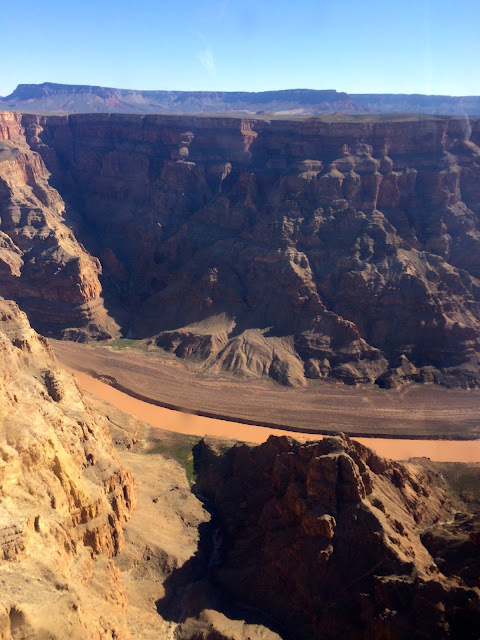 Something I absolutely could NOT believe is that there are no fences or railings of any kind at the edge of the canyon, except around the Skywalk itself. Other than that, you're on your own. 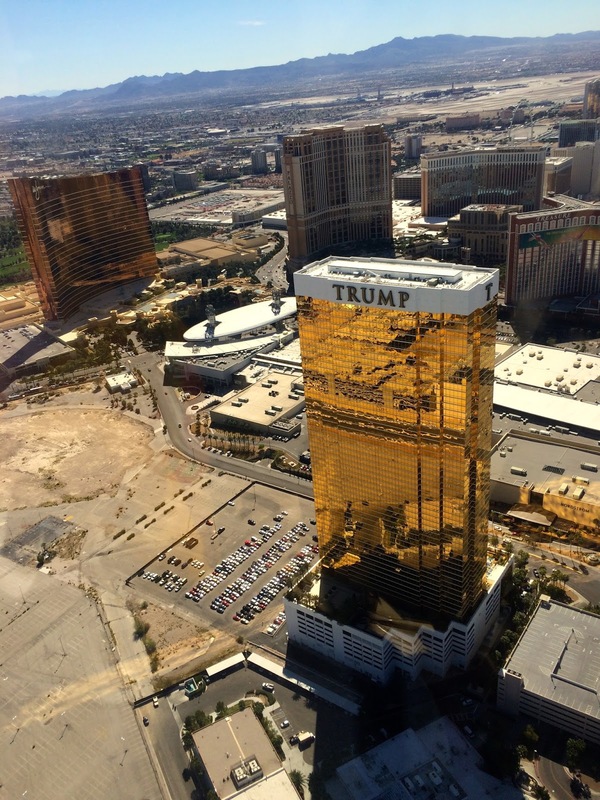 I really can't believe that they just let people wander around up there ... they're a trusting set of people. 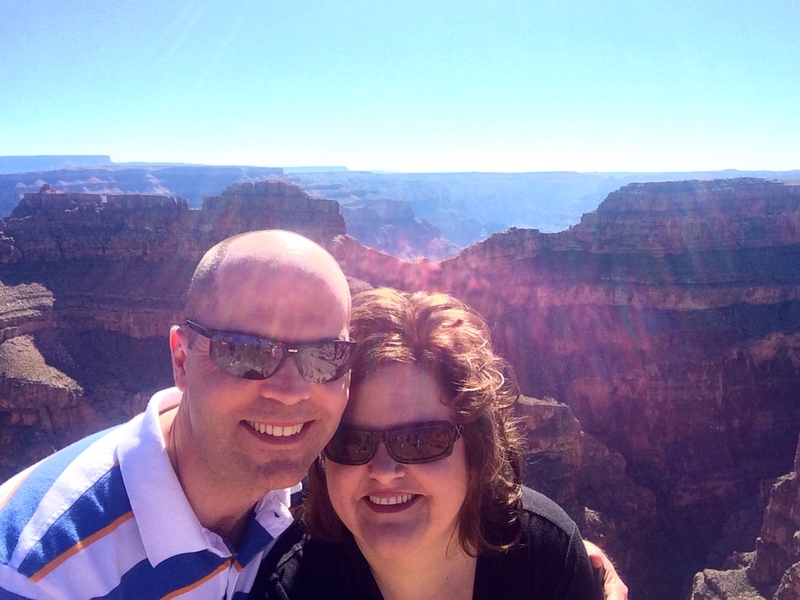 After we finished up at the canyon -- way too soon, in my opinion -- we headed back to Vegas. There is some serious SPRAWL in Vegas, Internet. It was fun that our pilot brought us back in over The Strip, though. 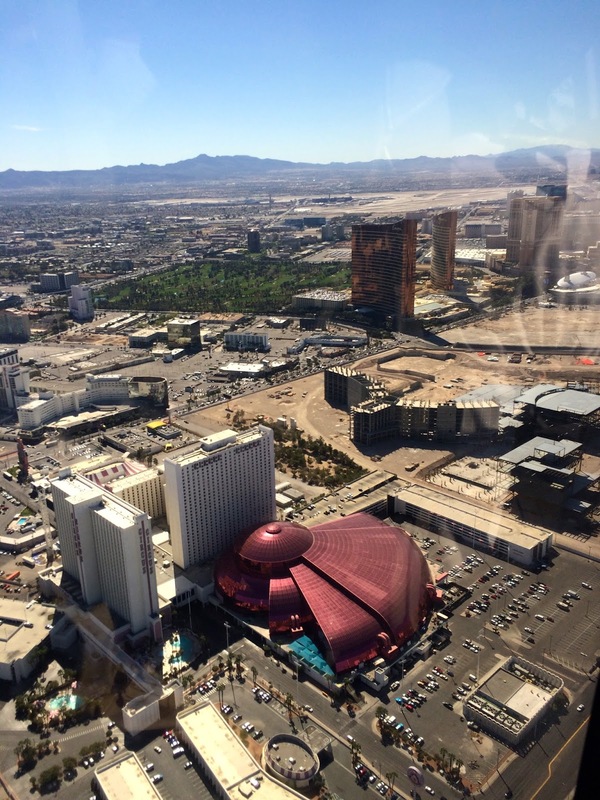 We got to see all of the hotels and casinos from a bird's-eye view. After we landed back at the airport, Vanessa and Grayson bought souvenirs, and then we hopped the shuttle back to the hotel. Vanessa had a little downtime before she packed her bag and rode back out to the airport to board her flight home, and Grayson and I had a whole 'nother day in front of us. 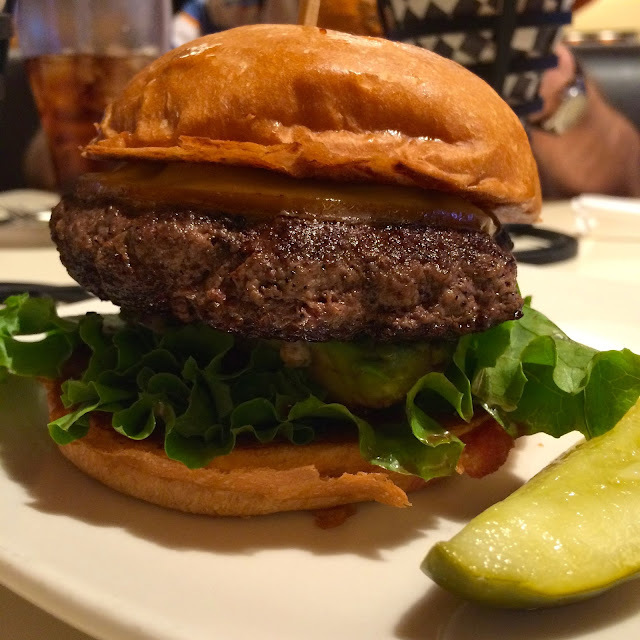 We decided to get a late lunch at I Love Burgers in the hotel. I enjoyed another Grass special: cheddar and avocado. 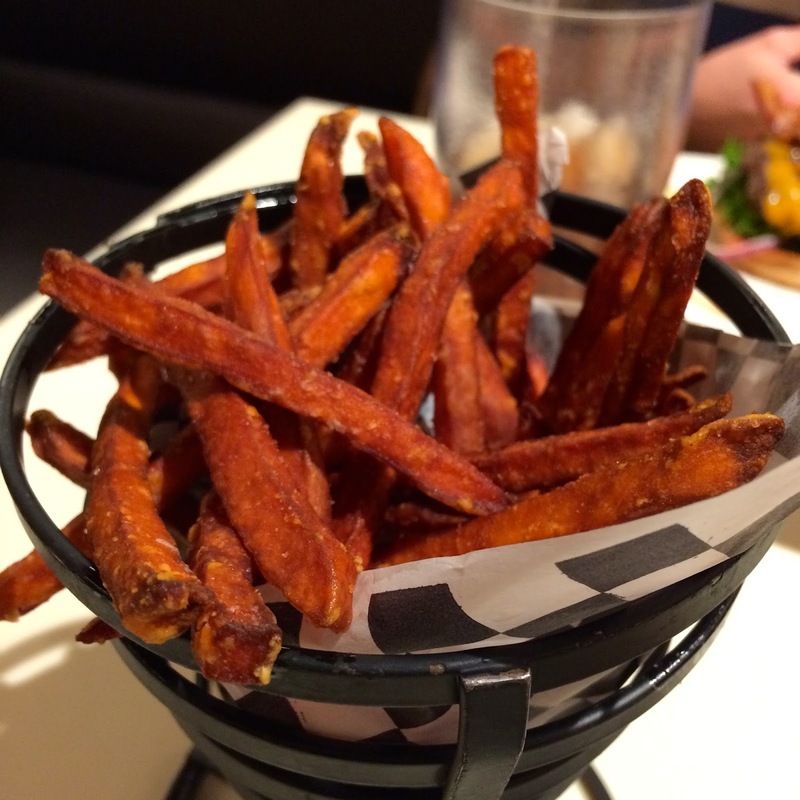 Oh, and sweet potato fries, which are a MUST. That afternoon, I'm thrilled to tell you that we took a nap! A NAP! I think it's the only one I've taken since we bought the new house, and it was amazing. Then we got up and walked to supper at Canaletto, where we were dining before seeing Whitney Cummings. I got a little pizza, and it was great. Afterward, we made our way to the showroom in The Venetian. I'm happy to report that Whitney Cummings puts on a great live show! She really engaged the audience, and most of her act involved talking to the audience and then reacting honestly to whatever they said -- so each show must've been unique to a degree. It was a full, great day!